Some scientists now say President Roosevelt was in a wheelchair because of Guillain-Barre syndrome, not polio. WASHINGTON (Reuters) -- Franklin Delano Roosevelt, the four-term president who directed his sweeping social policies from his wheelchair, may not have been struck by polio but instead by Guillain-Barre syndrome, researchers said Friday. The symptoms of Roosevelt's illness, which first became apparent in 1921, more closely resembled those of Guillain-Barre, also known as acute ascending polyneuritis, a team at the University of Texas Medical Branch in Galveston said. It is believed to be an autoimmune disease -- one in which the immune system mistakenly attacks healthy tissue. It occurs after a mild infection, surgery or, rarely, after an immunization. Either way, the diagnosis made no difference for Roosevelt -- there were no good treatments for either disease in 1921. He was president from 1933 until he died in 1945 of a cerebral hemorrhage. Writing in the Journal of Medical Biography, pediatrician Dr. Armond Goldman and colleagues said some of Roosevelt's symptoms did resemble those of polio, which is caused by a virus that can leave crippling side-effects. They include his fever when he first became ill and the permanent paralysis of some lower muscles. But others "were inconsistent with paralytic poliomyelitis that affects motor neurons but were typical of Guillain-Barre syndrome, an autoimmune disease that damages sensory and motor nerves," Goldman said in a statement. 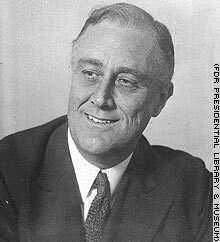 For instance, FDR was 39 when the disease struck (polio usually affects younger people), his paralysis affected both sides of the body evenly, he had partial facial paralysis early on, numbness, extreme prolonged pain and bladder and bowel dysfunction. Patients with mild to moderate Guillain-Barre syndrome usually recover entirely, but severe disease can cause permanent paralysis and even death, especially if not treated, Goldman's team said. "No one can be absolutely sure of the cause of Roosevelt's paralysis because relevant laboratory diagnostic studies were not performed or were not available at the time of his illness," Goldman said. There are no diagnostic tests for Guillain-Barre but it is assessed on the basis of its symptoms. With polio, a test of the fluid found in the spinal cord can confirm the diagnosis.